This lemon-flavoured mix helps with Nitric Oxide (NO) production at night when NO levels are lowest and supports energy, circulatory and vascular health. 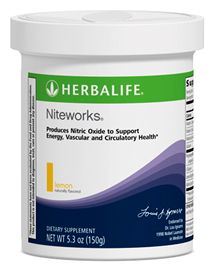 Developed with Nobel Laureate in Medicine Dr. Lou Ignarro, Niteworks helps your body produce Nitric Oxide (NO), for improved circulatory, immune and nervous system functions. L-arginine and l-citrulline trigger cells to produce and recycle more NO. Niteworks contains the amino acids L-arginine, L-citruline & L-taurine. High in vitamins C and E to protect the cells from oxidative stress. Mix Two scoops (two teaspoons or about 10 grams) with cold or sparkling water or juice. Drink at night or before bedtime.